As I perused my cabinets for something to snack on, I spied a variety of gingery treats. I didn't realize just how many different ginger things I have on hand. But oh, the taste of ginger is both spicy and sweet, and if you like ginger as much as I do, you'd say, "That's not TOO many gingery treats." raku beads, originally uploaded by pichurrayic. 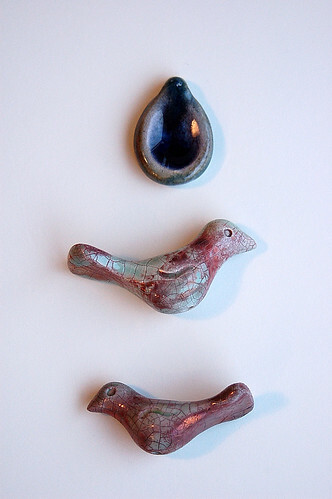 I bought these little raku birds and teardrop from a local bead store. They were the only real interesting thing there. Apparently they're handmade by a local artisan. They sort of remind me of Mollycoddle's stoneware buttons and pendants. I especially like the middle bird.